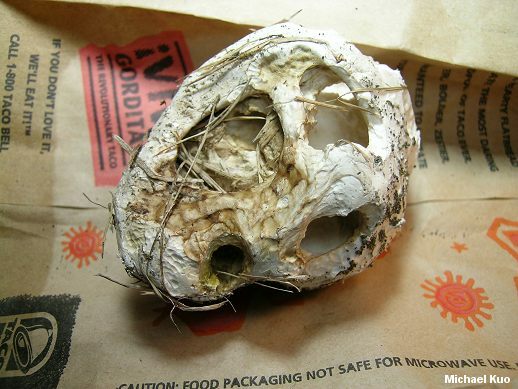 This softball-sized puffball has a very thick skin, but a soft interior. 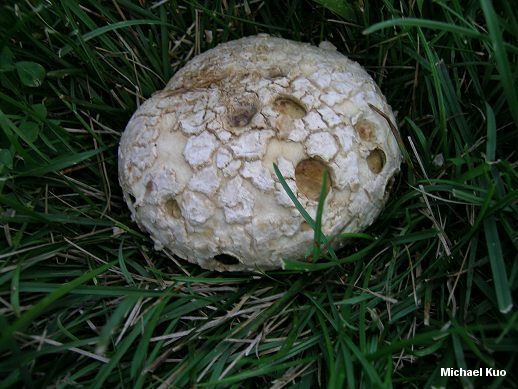 When young it looks like a species of Calvatia (perhaps a small Calvatia gigantea), and when old it looks a lot like Scleroderma polyrhizum. It is common in the Rocky Mountains and western North America, and occasional in eastern areas. Though Mycenastrum corium can perhaps be identified fairly easily without a microscope, its defining feature is microscopic: it features spiny capillitial threads. Mycenastrum corium is almost universally reported as occurring in conjunction with manure of horses or cows in pastures, meadows, and so forth--but the illustrated collections came from my front yard and a yard across town, where no one keeps (or has kept) livestock. Mycenastrum corium ssp. ferrugineum is a subspecies described in 2005 from Colorado; it features a rusty red to orange interior. Mycenastrum corium var. diabolicum, described from South America, features capillitial threads that are exceptionally spiny. 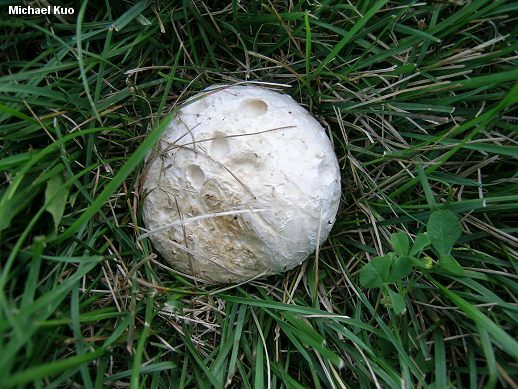 Ecology: Saprobic; terrestrial; growing alone or gregariously in grassy areas--especially in manure-rich meadows and pastures, but also in lawns; summer and fall; fairly common in the Great Plains, the Rocky Mountains, and western North America, but occasional in eastern North America. 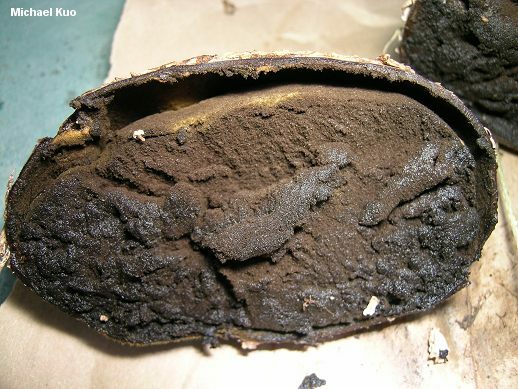 Fruiting Body: Shaped more or less like a ball; up to 20 cm across; outer surface soft and whitish, breaking up irregularly with maturity to expose a tough brownish inner surface with skin about 2 mm thick; interior white and fleshy, becoming greenish yellow and eventually turning to dark olive brown or purplish brown spore dust; without a stem or basal stem-like area. 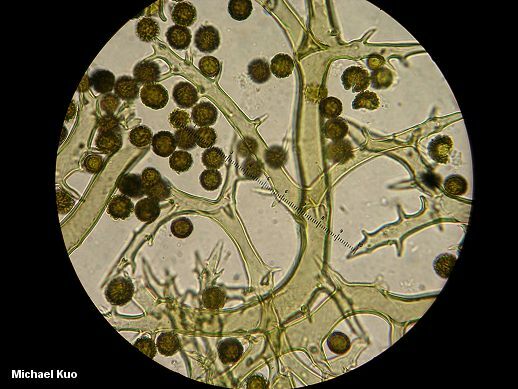 Microscopic Features: Spores 8-12 µ; round or nearly so; spiny, with spines up to 2 µ long; sometimes appearing nearly reticulate. Capillitial threads 10-30 µ wide; thick-walled; occasionally branched; bright olive yellow in KOH; with numerous spines and warts. REFERENCES: (Guersent, 1805) Desvaux, 1842. (Saccardo, 1888; Coker & Couch, 1928; Homrich & Wright, 1973; Smith, Smith & Weber, 1981; Arora, 1986; Lincoff, 1992; Miller, Brace & Evenson, 2005; Miller & Miller, 2006.) Herb. Kuo 07200708, 07200709.